A team of researchers and a mysterious hunter known only as “Crocodile Jack” venture into the swamp to battle a monstrous resurrected swamp beast that has been mutilating and devouring town locals. 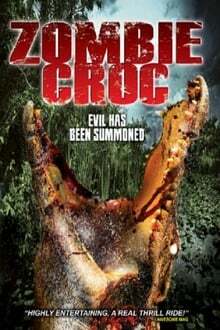 As they venture deeper into the swamps losing team members to the gigantic carnivorous undead reptile, they discover that a Voodoo Priest has been orchestrating the resurrection of not only the vicious ancient creature, but a horde of flesh eating zombies as well. It will take much more than big guns and brawn to stop the ZOMBIE CROC! Police commissary Funes and three researches of supernatural phenomena investigate inexplicable events that are occurring in the suburbia of Buenos Aires.